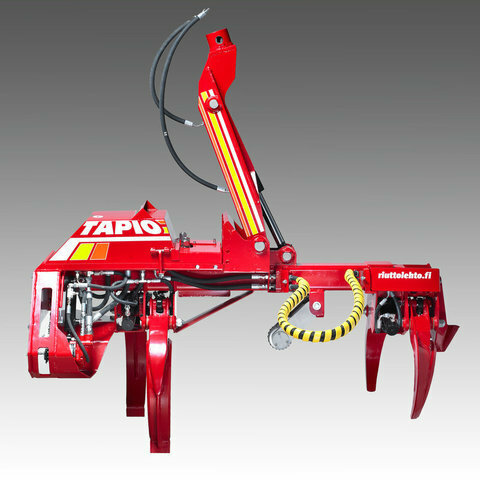 TAPIO harvesting head is the first single grip harvesting head in the world. TAPIO harvesting heads have been manufactured for sales already since 1981. The history of TAPIO harvesting heads is longer than the history of Riuttolehto Oy. Riuttolehto Oy obtained the manufacturing rights in the spring 2005 and continues the manufacturing of this excellent product. TAPIO stroke harvesting heads have obtained a firm position worldwide. TAPIO harvesting heads have been sold to almost every country where the tree is mechanically harvested. The main advantage of TAPIO harvesting heads is the combination of economical price, easy-of-use, minor need of service, simple and durable construction, strong delimbing power, minor fuel consumption and good delimbing result. The above mentioned facts allow many contractors, new to the mechanical harvesting section, to gain foothold in the market. Riuttolehto Oy manufactures many different sizes of harvesting heads; TAPIO 160, TAPIO 350, TAPIO 350EXS, TAPIO 400, TAPIO 400EXS, TAPIO 600EXS. All EXS –models (excavator model) have as standard additional valves for rotator and felling cylinder (tilt up and down). TAPIO harvesting heads have many different base machine alternatives depending on the working conditions; small farm tractors, small forwarders, big farm tractors, harvesting head base machines and excavators ranging from 6 - 20 tons. TAPIO harvesting heads are easy to mount onto the different kind of base machines. TAPIO harvesting head is easy to mount onto different kinds of base machines. The crane is equipped with hydraulic pressure, return lines and an electric cable. The main switch, control unit, measuring device and control panels are mounted in the driver’s cabin of the base machine. The harvesting head can be installed in both an open and a closed hydraulic system. There are many ways of installing. Further information can be obtained by contacting the manufacturer or the seller of the device. The block valves of the harvesting head are closed type. The installation is made by mechanics authorized by the manufacturer or the importer.